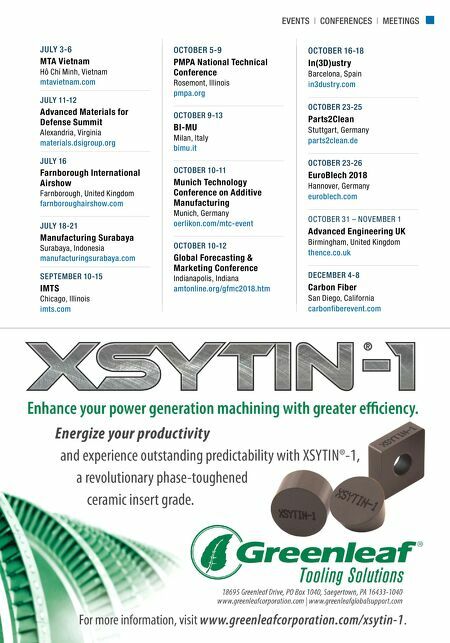 EVENTS | CONFERENCES | MEETINGS WEBINARS FROM THE ARCHIVE Minimize Non-Production Setup by Automating Your Programming Autodesk | gbm.media/autod/0418 FROM THE ARCHIVE Turning to New Heights Hardinge | gbm.media/hardi/0418 Find current listings and archived webinars at mmsonline.com/webinars SEPTEMBER 11-12 Chicago, Illinois additiveconference.com The Additive Manufacturing Conference focuses on industrial applications of additive technologies for making functional components and end-use production parts. It will cover the processes, applications and materials to give practical knowledge on how to implement the technology. Attendees will learn from and network with leaders in all aspects of industrial AM. 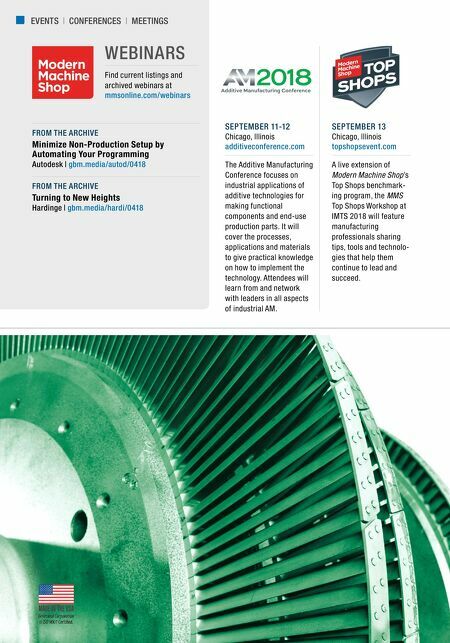 SEPTEMBER 13 Chicago, Illinois topshopsevent.com A live extension of Modern Machine Shop's Top Shops benchmark- ing program, the MMS Top Shops Workshop at IMTS 2018 will feature manufacturing professionals sharing tips, tools and technolo- gies that help them continue to lead and succeed.